A TV show which depicted a bizarre love story between a nine-year-old boy and an 18-year-old woman has been pulled off air following criticism that it promoted child marriage and was regressive. The BBC's Geeta Pandey in Delhi explains why the show outraged some Indians. 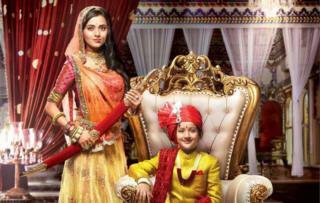 In a statement on Tuesday, Sony Entertainment Television said they were cancelling the controversial daily soap Pehredaar Piya Ki (Husband's Guard). The channel did not give any reasons why it was being taken off air, but the show, launched in mid-July, had attracted a lot of negative attention right from the beginning for the "unusual" love story at its centre. The show's troubles began when Jai Ho Foundation, a Mumbai-based non-governmental organisation, petitioned authorities, demanding "an immediate ban" on it, describing it as "indecent" and "unfit for children". It also prompted a lot of social media outrage in a country where child marriage is still rampant. It opens with chubby-cheeked Prince Ratan Kunwar, the scion of a wealthy royal family, meeting fresh faced Diya and falling in love with her at first sight. He follows her around, taking photographs of her and "saves" her from a cockroach. She pulls his cheeks, gives him a peck, and humours him by accepting when he proposes marriage to her. She also saves his life when he accidently slips and his life hangs in the balance. "I'll not let any harm come to you," she proclaims. Her promise is music to the ears of his parents who are paranoid that their evil relatives are trying to harm their son. Their paranoia is not without reason though - the palace is a place of intrigue and when the evil relatives get a chance, Ratan's mother is killed and his father is grievously injured. On his death bed, he extracts a promise from Diya to marry his young son because "she's the only one who can protect him". "When the first few episodes were shown, opinion was divided. Critics said the child was creepy and stalking her, others praised the show saying it showed the 18-year-old as someone who was empowered and decisive," Megha Mathur, a journalist at The Quint who sat through 15 episodes of the show, told the BBC. "I didn't really think he was being creepy though because it came across as harmless infatuation," she added. And that makes sense because in India, where from a very young age children are brought up with the idea that everyone must get married one day, it's normal to see little girls and boys telling parents or other family adults they like that they want to marry them when they grow up. "But around the fifth episode, the nine-year-old started to behave like he was all grown up and I think they lost the plot," Ms Mathur says. "A child is seen caressing, stalking and having a relationship of a sexual nature with a lady who is more than double his age... This is an indecent and obscene representation of a child for the purpose of representing sexual relationship," the Jai Ho group said in a complaint letter to India's Information and Broadcasting Minister Smriti Irani. A petition addressed to Ms Irani on change.org gathered more than 100,000 signatures, prompting the minister to write to the Broadcasting Content Complaints Council (BCCC) to take "prompt action" against the show. The BCCC ordered the show timings to be changed from the prime time slot of 8:30pm to 10:30pm and the show also began putting out a disclaimer saying "we do not support child marriage". The makers of the serial also said that they were planning "an age leap" and sometime over the coming weeks, the boy prince would turn 21. But for the critics that was not enough. "No one really looks at disclaimers," Jai Ho Foundation president, Afroz Malik, told the BBC on Tuesday morning. "The young couple talk about going on a honeymoon. There's talk of suhaag raat [consummation of marriage]. That's not the right depiction of a child," he said. Unless they change the script now, he said the foundation would petition the courts. That would no longer be necessary. Is a child bride really married every seven seconds?